This is another episode from Previously on Amara from March of 2008. She wasn’t quite 4 years old yet. With so much of this country waist deep in snow and with Southern California expecting a balmy 72° today, it seemed like good timing! I grew up in Michigan where the winters are very cold and where snowball fights were something we loved as kids — even as grownups. In Southern California we almost NEVER get snow. And I like it that way! If I never see snow again, that is OK with me. Of course Amara feels much differently. A couple of years ago her preschool teacher taught the class how to have snowball fights without ever getting cold or wet. You make your snowballs out of waxed paper! They fly very well when you throw them, unlike snowballs made from Kleenex which don’t fly well at all. These snowballs won’t break anything if they miss their target and hit something valuable. And you can stock up a whole pile of them before you call Grandpa in from the office and bombard him with snowballs! This really was a lot of fun and gave her a chance to practice throwing and to run around and giggle with Grandpa. She’s coming over tonight. Maybe we should "get Grampy" again! I’ve got lots of waxed paper. This memory was posted in Indoor Fun, Previously on Amara and tagged Amara, Grandma, Grandpa, school, snowball fight, waxed paper on February 5, 2011 by Grandma Kc. paper snowballs is very inventive! Silly computers! Sometimes they just have a mind of their own. Thanks for visiting — sure am glad I don’t have your snow! I would have never thought of waxed paper snowballs, but when we were kids we used to take waxed paper to the playground and sit on it while we slid down the slide. After a few rounds, you can really fly! My husband tried this with the grandsons last summer. It still works if you can find an old-fashioned slide made of metal. Now, I’m not really recommending this as I wouldn’t want anyone to get hurt. . . but just saying! The highlight of Hannah’s next sleepover at Nona’s will be a snowball fight in the living room and then we will stockpile them for when he daddy comes to pick her up in the morning. Thanks for the creative and fun idea! Hope you have as much as we did!! Too fun! My grandkids’ Awana program does these kinds of snowball fights and the boys LOVE them! Too fun! 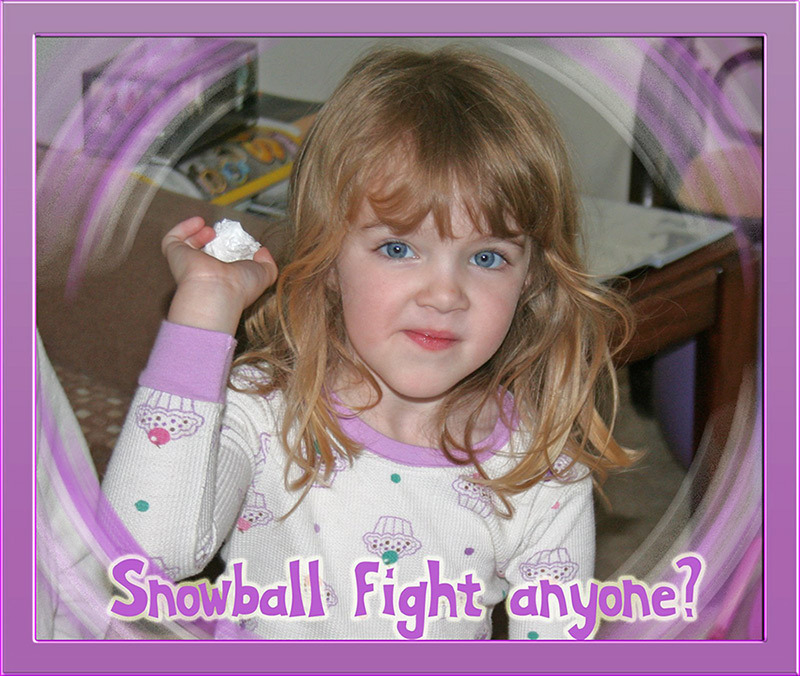 My grandkids’ Awana program has these types of snowball fights and all the kids love them! Time for me to try this with my grandsons. When you first posted it, Bubby wouldn’t have been able to fling a ball, waxed paper or not. I have a feeling it will now be a blast (despite Mac likely being the victim of repeated hits, I’m sure).